Grass Valley Turbo(tm) iDDR system.ORLANDO, FL--LMG recently invested in 12 new Turbo-R iDDRs from GrassValley, each of which includes one record channel and two playback channels. In addition to their audio/video connectivity, the playback devices have HD and SD video content capability. 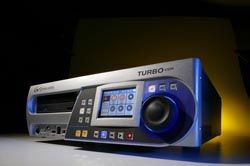 "The Turbo is a very user-friendly digital device that allows the interfacing of many different types of media," said Les Goldberg, CEO of LMG. "We believe it will become a new standard in the show environment." LMG has provided video, audio and lighting support for some of the world's largest conventions and meetings, nationally televised events and FORTUNE 500 company business presentations. For more information visit www.lmg.net.